OMG. Did you know that you can dye your own leather boots yourself? As a leather lover (and a DIY lover), you would think that little detail would be something I was already familiar with, but I had no idea that it was possible until a friend of mine mentioned it to me recently. The idea would have interested me anyways, but I was especially excited because I’d been complaining about not being able to find a black version of some weathered brown boots that I’ve had for a few years. Leather dye? Problem solved. 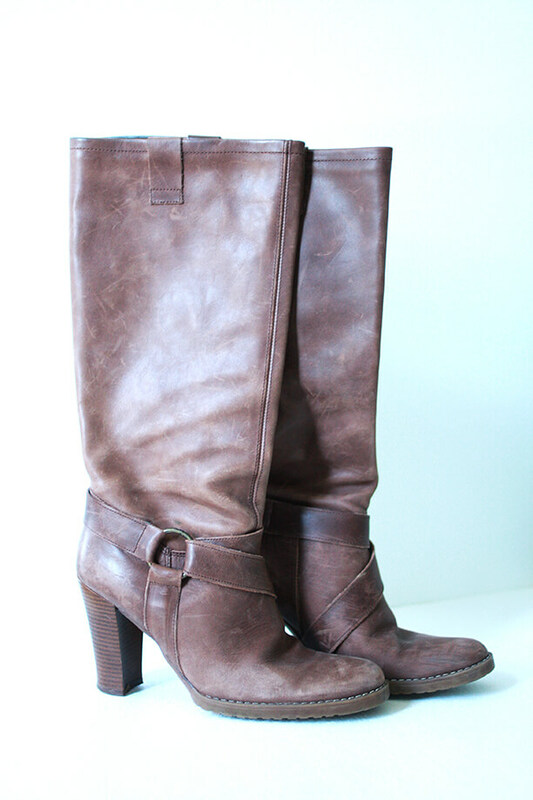 Here’s what my brown boots looked like before the transformation. I bought them years ago and they have definitely been worn quite a bit since then. For this DIY you’ll need: Leather deglazer, leather dye, leather sheen finish, wool daubers, and cotton rags. 1.) Most leathers have a finish that needs to be removed before the dye is able to penetrate the surface of the leather. Use a cotton rag and rub the deglazer all over surface of your boot (I would do this step outdoors if possible, the fumes are really strong). 2.) While the deglazer is still damp, pour your dye into a small disposable container and dip your wool dauber into the dye. FYI, I would use rubber gloves during the dying process if you want to keep your hands in tact. Use the dye and wool dauber to completely cover your boot in the dye (I used a small paintbrush to paint the dye where the sole and heel meet the leather) and let dry for 30 minutes. Add a second coat of dye if needed and wait another 30 minutes before lightly rubbing off any excess dye with a cotton rag (just wipe gently, don’t scrub the leather). 3.) Once your dye is dry, don’t worry if your boots are looking rather dull and splotchy- that’s what this last step is supposed to correct! 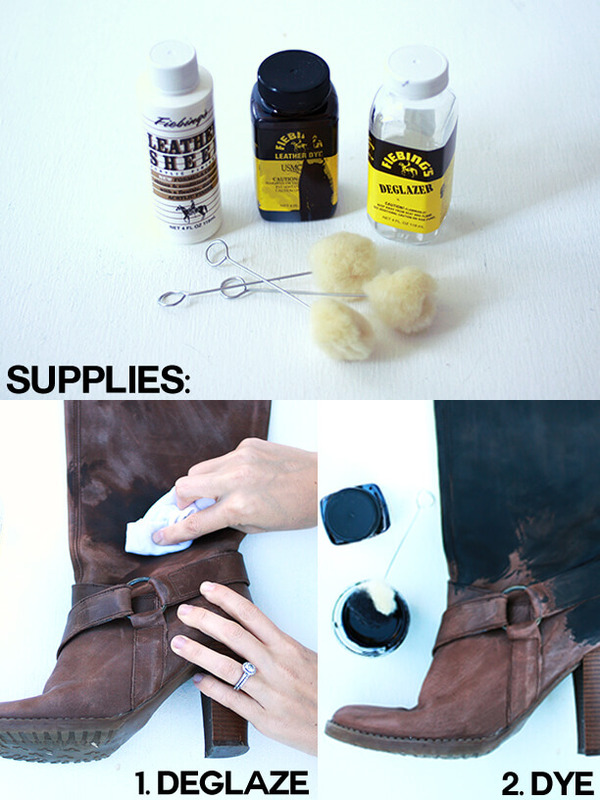 Pour some leather sheen onto a rag and buff the leather in small circles all over your boot surface. This should bring out the sheen and richness of the new color. That’s it- you’re done! I can’t tell you how happy I am with the final product. I was really just hoping that the boots would be good enough to wear until I could find a better (and newer) pair of black boots, but they turned out so well and look so revitalized that there’s no need to look any further for a replacement. 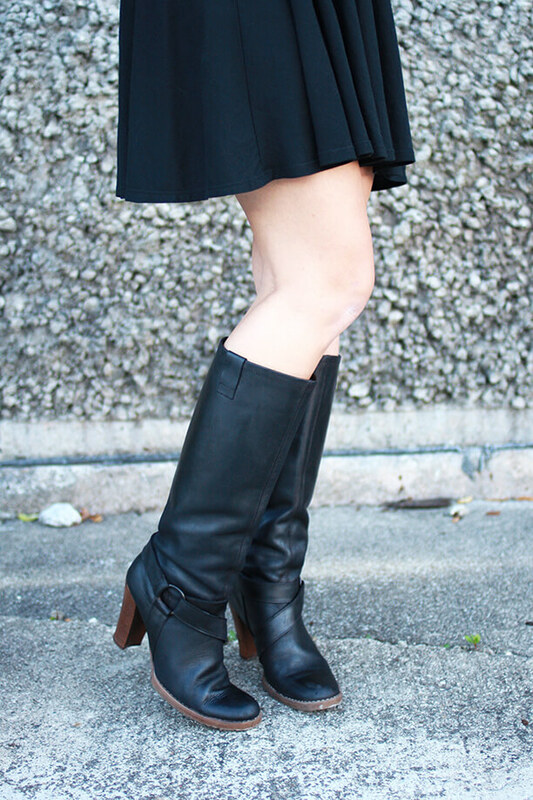 Not that I won’t buy any more black boots this fall in other boot categories (you know, like booties, ankle boots, flat knee-highs, over the knee, some with more studs, some with less studs..). Categories: HCYMT? 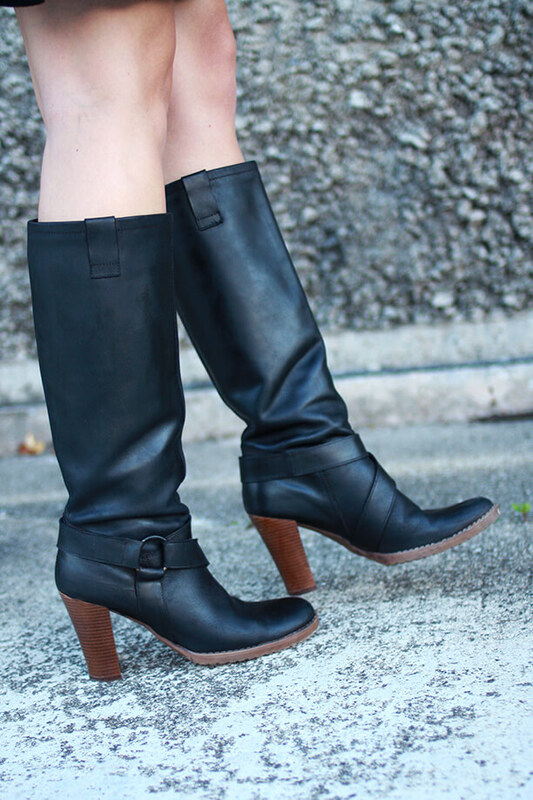 | Tags: dye, leather boots | October 16, 2013 by thebandwifeblog. Wow! I’m so impressed with how these turned out!! Love them! U did an awesome job!!! !..the boots look brand new!! whaaaaat?! dying leather?! thats AMAZING! The ‘new’ boots look great! I like the black so much better than brown – more versatile for sure! LOVE LOVE LOVE! I am so happy you did this DIY. I can’t wait to try it myself! 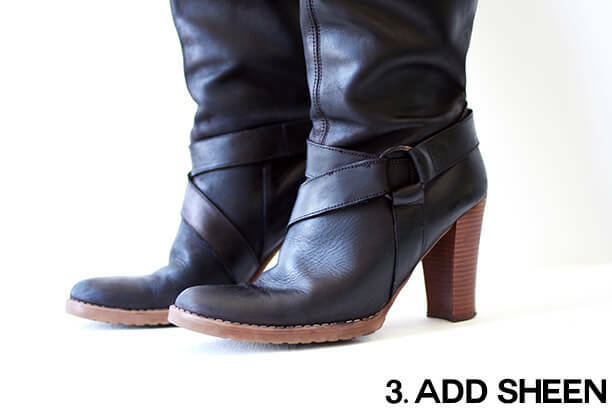 What a great way to save a favorite pair of boots and the best part is that you don’t have to break them in. Love this idea. Amazing transformation! I work for a big handbag manufacturer in the UK so I see all the different leathers we get in and how easily they can be coloured – so pretty! I would have never thought of dying boots myself! I’m trying not to think of all the great boots I got rid of because they were just looking tired. 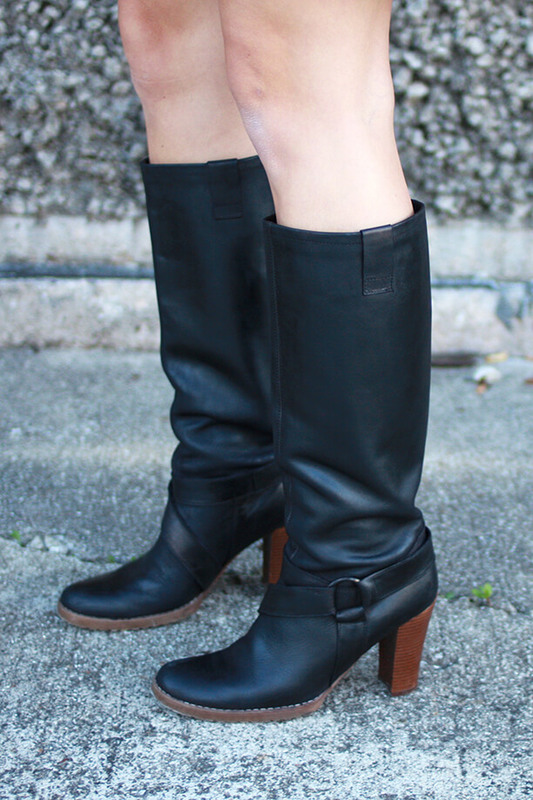 Thanks so much for this post – your boots look like they’re brand new – they turned out great! I’m definitely giving this a whirl!! Well done! These look great! I don’t know how well it would work, but you could try it! Did you have any issue with the metal ring on your boots getting tarnished when you dyed them? Thank you!! I didn’t have any issues with the metal ring, but I did wipe off any excess from the ring pretty quickly. If they were just a cheap buy, I would certainly give it a try! I would just do the same thing I showed in this post but with a brown version of the dye. Good luck, hope it turns out! I wanted a burgundy leather bag, I found the perfect one in a tan, I stripped and dyed it and have been very happy with the results. I did it about 5 years ago and some wear on the corners etc shows the tan through but this just gives it a vintage look- I like it even more. I’ve dyes belts for my BF before and also bought natural leather belting and made my own belts- denim blue, grass green, silver, gold etc. Actually very easy to do. I buy all my stuff from Tandy Leather (I am in Australia but they are a US company). Am about to embark on dying mid brown cowboy boots to a gold colour, I am aiming for an uneven texture colour (so dab not wipe colour on) to make them look more worn and vintage. I keep an eye on eBay for cheap but good leather boots. 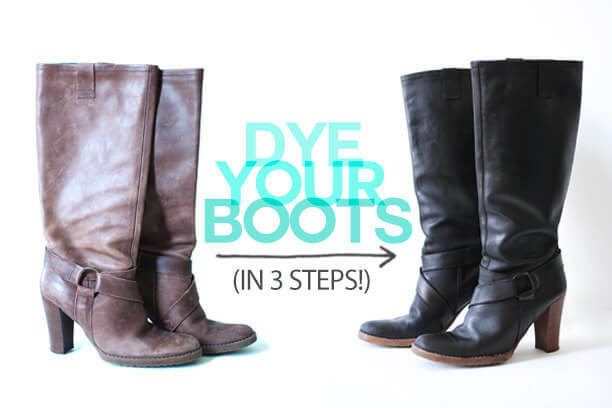 I am very glad to know that when I decide to buy boots I might just start out with white and then buy the three step dye job I learned about on your website. Dam Good news for Salt Lake City, Utah boot fans! Hey, just wanted to let you know I dyed a pair of vintage cowboy boots and I also dyed the edge of the sole and the heels black and they look really great! I wanted the entire boot black. Yay! Glad you love them! Your boots look great! I have a question: Can dyed boots get wet, or will the dye leak? I’m thinking of dying cowboy boots black for my husband to wear in a wedding (he is the best man). It’s an outdoor winter wedding, and I can just imagine him standing in a black puddle at the front of the ceremony! My brown boot situation the same. Looking online to buy a black pair. Way too expensive. Your solution looks great and cheaper than forking out a fortune for another pair in black. I’m gonna try your solution. Thanks! I’ll post my results here. May I suggest adding where one can find the items/products you used to dye your boots. Wondering if you have any advice…I dyed light tan leather boots to a medium brown, and there are spots on the top of the foot where the leather has taken on a metallic sheen. I haven’t conditioned them yet, only the dying step (using same products as in picture). Any advice? Wondering if I should “deglaze” that spot and try again? Now that they are black, how to they look when they are scratched or scuffed? Does it show previous brown color underneath? Also can you still use leather cleaner on them? Thanks! Hi there..i know this is an old thread but hoping i can get a few answers: 1) was a 4ounce bottle each of the dye and deglazer enough for a pair of tall boots? 2) Is it an oil dye you used? I could not tell from the picture. I don’t know if it’s an oil dye or not but the bottles I linked were enough to do the tall boots I did. Hope yours turn out well! How much dye did you use to dye these boots? I got a little ahead of myself and started dying with some wet spots still on the boots. I dyed them tan and the wet spots turned super dark and won’t go away now. Any advice? In an earlier comment you said the 4oz bottles were enough to do the tall boots. Did you have any left over? 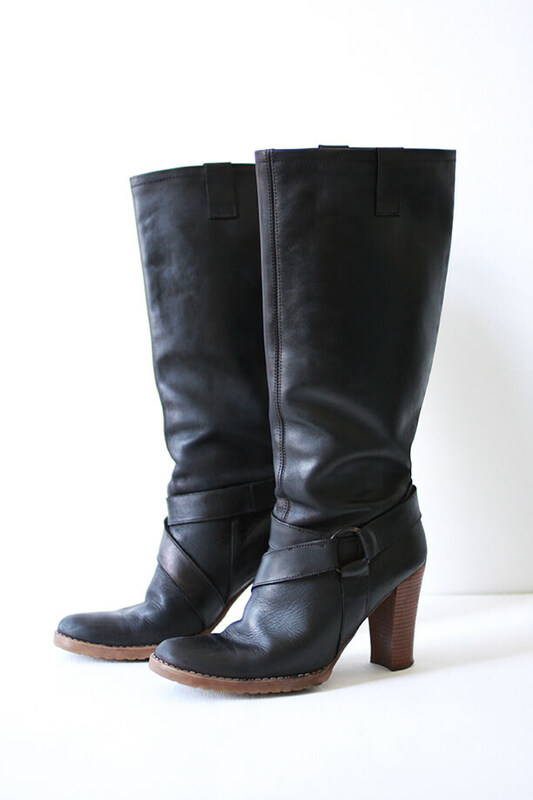 I have 22 pairs ankle high boots that I wanted to do. Do you think one of each of the bottles will do the trick? Yours came out great. Thanks for the inspiration.